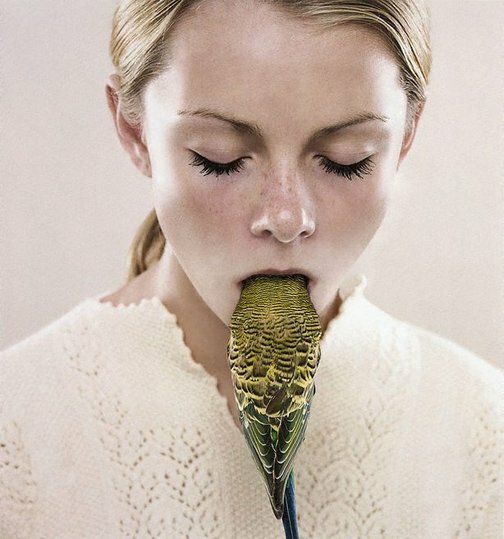 Born in Sydney, Petrina Hicks studied photo media at Canberra School of Art, ANU and now lives and works in Sydney. She has produced several series of photographs in the last 4 years focusing on young people, and is particularly interested in showing the tension between beauty and imperfection. 'Shenae and Jade' is typical of Hicks’ unconventional portraits. The young model holds the budgie’s head in her mouth. It’s the kind of slightly dangerous behaviour which can be unnerving to observe. The freckled nose of the model is in tension with her smooth pale temples, heavily lashed closed eyes and soft white top. The luminescent background and generally pale colouration throw the headless body of the brightly coloured budgie into high relief. Hicks has won several prizes including Sydney Life, Art & About 2004 and the Josephine Ulrich Photography Award for Portraiture 2003. She has most recently exhibited in Melbourne in 'Light sensitive: contemporary Australian photography from the Loti Smorgon Fund' at the National Gallery of Victoria. Petrina Hicks , 2006, back cover (colour illus.). Australian Centre for Photography Summer events guide , 2006, (colour illus. ).